Whole hog barbecue is a culinary art form that is both disappearing and experiencing a renaissance. In The One True Barbecue, Rien Fertel chronicles the uniquely southern art of whole hog barbecue-America's original barbecue-through the professional pitmasters who make a living firing, smoking, flipping, and cooking 200-plus pound pigs. More than one hundred years have passed since a small group of families in the Carolinas and Tennessee started roasting a whole pig over a smoky, fiery pit. Descendants of these original pitmasters are still cooking, passing down the recipes and traditions across generations to those willing to take on the grueling, dangerous task. This isn't your typical backyard pig roast, and it's definitely not for the faint of heart. 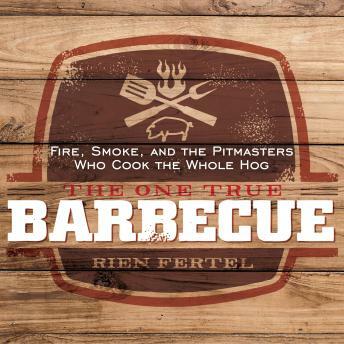 Fertel finds the gatekeepers of real southern barbecue to tell their stories and pays homage to the diversity and beauty of this culinary tradition. For anyone who has enjoyed the heavenly taste of tender, smoky, tangy whole hog, The One True Barbecue illuminates the origins and nuances of America's one true cuisine, and is an eye-opening and deeply enjoyable look at the fascinating and complex makeup of southern heritage and tradition.